I love cheesecakes. That's saying a lot since although I bake a lot, I am not a huge cake fan. I just love to bake and to feed people. But put a slice of cheesecake or an entire chiffon cake in front of me, and well, I turn into a cake monster. Hence, I only bake cheesecakes when we have company for dinner. Over the weekend, we invited some friends over for dinner so we could talk shop and the kids could play. Since we had guests coming, I made a cheesecake. And I knew exactly which cheesecake I was going to make since the recipe has been sitting on the top of my to-bake list for a while. 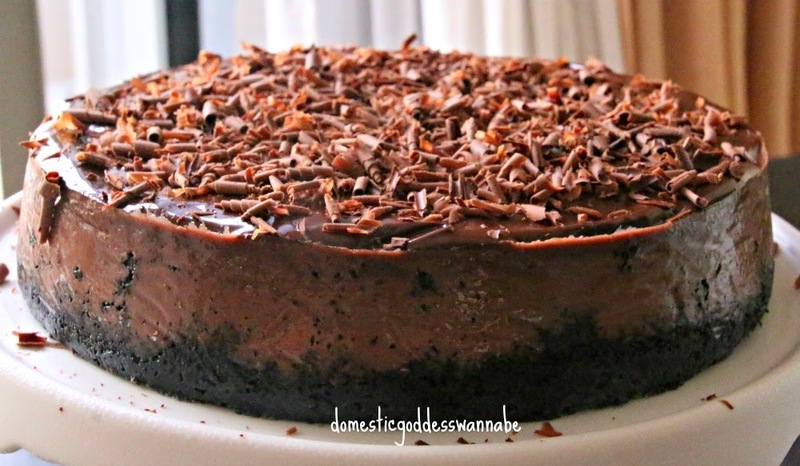 Bailey's Irish cream + Chocolate = a damn fine cheesecake idea! Cheesecakes are really not that hard to make. I shudder each time I see the prices shops are charging for one slice of cheesecake! Here are the step-by-step pictorial instructions on how to make this cake. In the bowl of a food processor, blitz the Oreo cookies (or any chocolate biscuits) until they turn crumbly. If you do not have a food processor, place the Oreo in a ziplock bag and gently bash with a rolling pin. Add melted butter and continue to pulse until the crumbs come together. Transfer the crumbs into a lined and lightly greased 9-inch Springform pan. Press the crumbs with a small cup (or any other tool) so that they are packed and line the base as well as a little up the sides of the pan. Place this in the fridge to chill. In a clean food processor bowl, add the cream cheese. 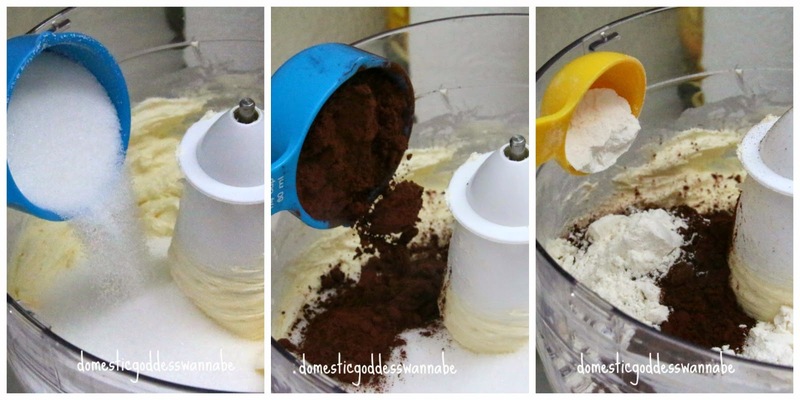 If you do not have a food processor, you can also use your mixer. Add sugar, cocoa powder and flour. Blitz until well blended. Add the eggs, one at a time, and blitz to combine before adding the next egg. Add sour cream and Bailey's, and mix on low speed until combined. Do not over mix! Pour the cream cheese mixture into the Springform pan. Lift and gently tap the pan a few times on the table top to remove any air bubbles. Wrap the pan in heavy-duty aluminium foil (or 2 layers of normal foil). Place the pan into a baking tray. Pour boiling water (very carefully) until the water reaches about halfway up the sides of the Springform pan. Bake at 230°C for 10 minutes, then reduce the temperature to 120°C and bake for an additional 60 minutes. At the end of the baking time, prop the oven door with a wooden spoon so that it is slightly ajar. Allow the cheesecake to cool in the oven for at least 30 minutes before removing it from the oven. This reduces shrinkage. Chill the cake in the pan for at least 4 hours (preferably overnight) before serving. To make the ganache, heat heavy cream over medium-low heat until bubbles start to form at the edges. Remove from the heat and pour over the chocolate. Let the cream sit for about 30 seconds before gently stirring or whisking until all the chocolate has melted. Set this aside for 30 minutes before using. The ganache will thicken slightly as it cools. 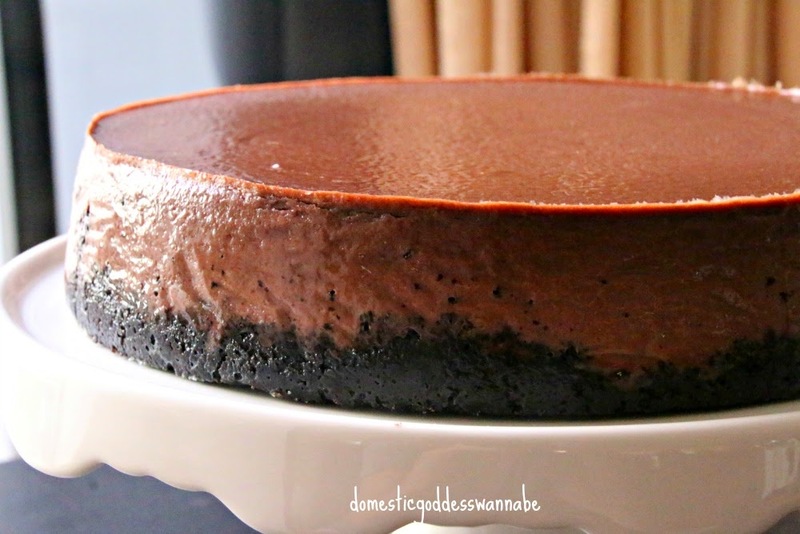 Pour the ganache over the cheesecake and spread with an offset spatula. Top with chocolate curls or chocolate chips to serve. 1. In the bowl of a food processor, blitz the Oreo cookies (or any chocolate biscuits) until they turn crumbly. If you do not have a food processor, place the Oreo in a ziplock bag and gently bash with a rolling pin. 2. Add melted butter and continue to pulse until the crumbs come together. 3. Transfer the crumbs into a lined and lightly greased 9-inch Springform pan. 4. Press the crumbs with a small cup (or any other tool) so that they are packed and line the base as well as a little up the sides of the pan. Place this in the fridge to chill. 1. In a clean food processor bowl, add the cream cheese. If you do not have a food processor, you can also use your mixer. 2. Add sugar, cocoa powder and flour. Blitz until well blended. 3. Add the eggs, one at a time, and blitz to combine before adding the next egg. 4. Add sour cream and Bailey's, and mix on low speed until combined. Do not over mix! 5. Lift and gently tap the pan a few times on the table top to remove any air bubbles. Wrap the pan in heavy-duty aluminium foil (or 2 layers of normal foil). 6. Place the pan into a baking tray. Pour boiling water (very carefully) until the water reaches about halfway up the sides of the Springform pan. 7. Bake at 230°C for 10 minutes, then reduce the temperature to 120°C and bake for an additional 60 minutes. At the end of the baking time, prop the oven door with a wooden spoon so that it is slightly ajar. Allow the cheesecake to cool in the oven for at least 30 minutes before removing it from the oven. This reduces shrinkage. 8. Chill the cake for at least 4 hours (preferably overnight) before serving. 1. Heat the heavy cream over medium-low heat until bubbles start to form at the edges. Remove from the heat and pour over the chocolate. Let the cream sit for about 30 seconds before gently stirring until all the chocolate has melted. 2. 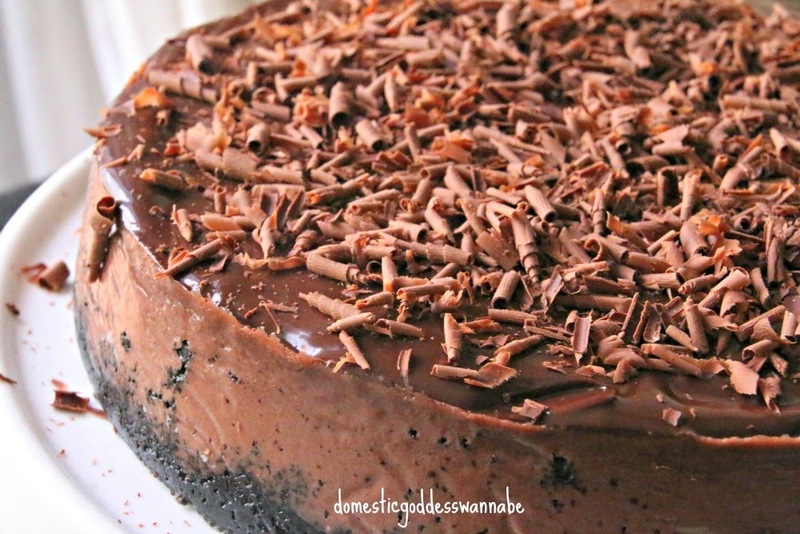 Pour the ganache over the cheesecake and spread with an offset spatula. 3. Top with chocolate curls or chocolate chips to serve. I am linking this post to Weekend Potluck hosted by The Better Baker. Yum! Yum! Yum! Diana, I don't know what else to say LOL! I really like the way you have described the recipe. On the other hand, if you are an expat and plan on moving to Singapore, you may want to check out www.placematch.sg. I found it to be very useful in finding a place.